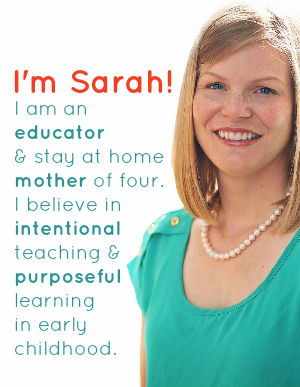 Summer is almost here which means it’s time to revisit a favorite preschool theme. Ocean theme! And what preschooler doesn’t love to play with some seashells and deep blue, salty like the ocean, playdough? I haven’t met one who doesn’t, so I can always count on an ocean themed invitation to play to be a hit! There’s something about seashells. They are these beautiful chunks of calcium carbonate tat used to house mollusks in the ocean. They shine with a luster that is hard to reproduce with man-made materials and their shapes can be quite intricate or very basic. But when my preschoolers happen upon a box of various seashells , which is what happens during our ocean theme, they cannot help but question how it can about, how and why its shape was made, and what kind of animal, exactly, lived in it at one time ago. This is why I love offering my preschoolers some seashells to use in an ocean themed invitation to play. 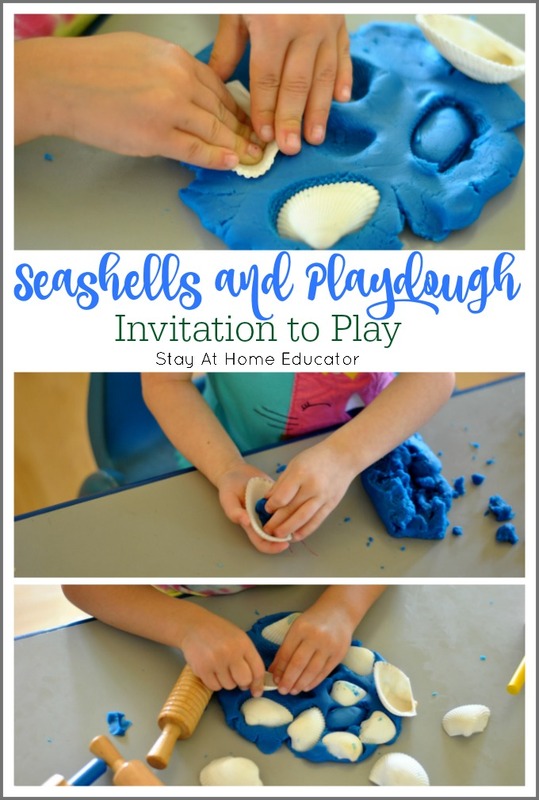 It’s just seashells and playdough, however using their hands to play and change the playdough with the seashells is a perfect way to start their questions rolling since seashells play a large part in our ocean theme. Most of the preschoolers began by flattening out their playdough so they could make prints of the seashells. They used them like cookie cutters, cutting away the outlying playdough to create a cookie-like shape, and they used them to press the exterior shape into the playdough, revealing their lines and scalloped edges. We actually began with two colors of playdough, a lighter blue and a darker one. Throughout the play, the two colors got mixed together, forming a color in the middle, which was the point. 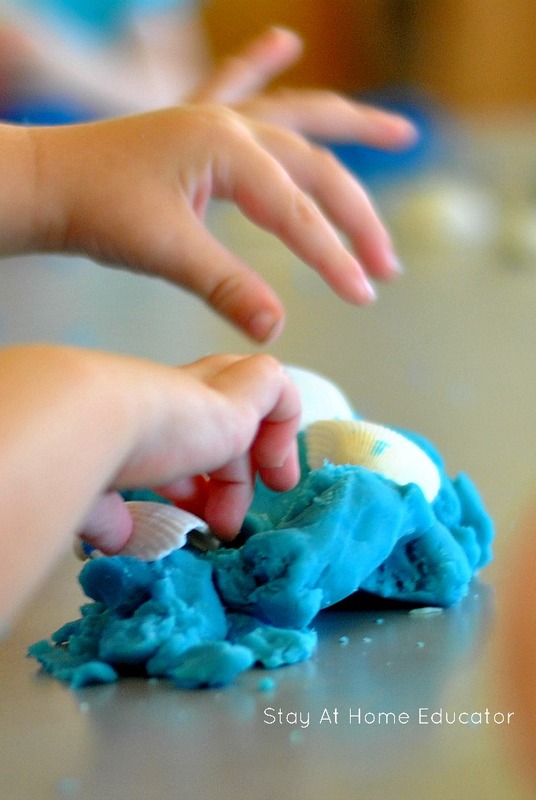 Playdough makes the best hand strengthening material as children push and squeeze, building the muscles in their whole hand, and even in their forearms and core. Some of the preschoolers wanted to fill the seashells, so they broke off tiny bits of playdough to smoosh into the shells. Others wanted to see how many seashells they could fit on their patty of playdough. They learned that it depended a lot on how flat they could roll out their playdough pancake as well as how big the seashells were. Other preschoolers rolled their seashells into the playdough, hiding them, only to pick apart the playdough to reveal the seashells again. Here’s the thing about an ocean themed invitation to play. 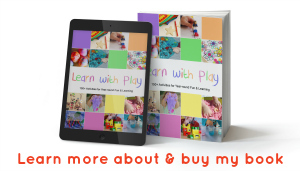 Preschoolers love it! 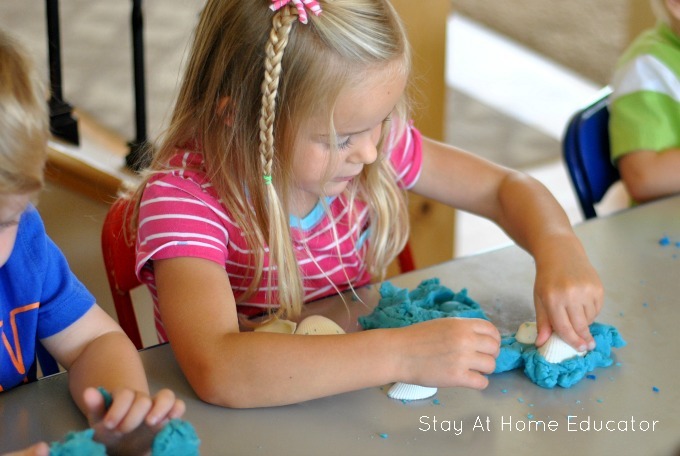 And with just a few seashells that can be purchased at a minimal cost and some playdough that is even cheaper to make, once introduced this easily becomes a favorite activity in our ocean theme. We will have to collect some shells on our Florida trip. 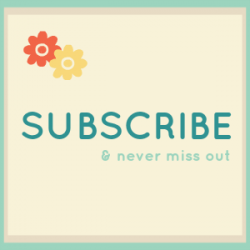 This is so simple, and I bet my son would love the shells!